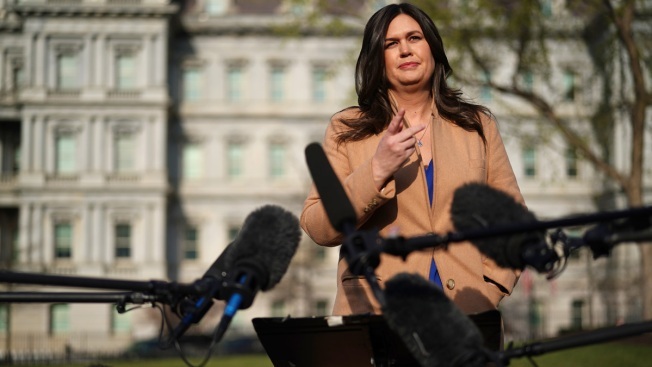 In this April 4, 2019, file photo, White House Press Secretary Sarah Huckabee Sanders talks to reporters after talking to FOX News outside the West Wing of the White House in Washington, DC. "Democrats continue to show day in and day out that they're nothing but sore losers," Sanders said. "I think they're a sad excuse for a political party." The White House is offering another rationale for why Democrats should not get their hands on President Donald Trump's tax filings: They're not "smart enough" to properly understand them, NBC News reported. Sanders said Trump has "been clear since the beginning that as long as his taxes are under audit he's not going to release them" and has "also filled out hundreds of pages in financial disclosure."